Rev your engines, people. Spring weather has arrived on the West Coast at long last, which means L.A.'s most stylish group of women get to test-drive the latest spring trends before most of the rest of the country. NYC may get more credit for setting trends, but thanks to the beautiful weather we're blessed with here, Angelenos are getting a bit of a sartorial head start. To celebrate the new drop from our Who What Wear collection, we hung out with some of the city's chicest style setters at the newest Culver City hot spot, Margot. Amid a picturesque brunchscape, L.A. girls showed off their best spring outfits and styled pieces from our collection in seriously genius ways (so much inspiration up ahead). Naturally, there were a few key trends they all unanimously decided upon—coincidence? Continue on to see which trends L.A. girls are favoring now and shop each one. 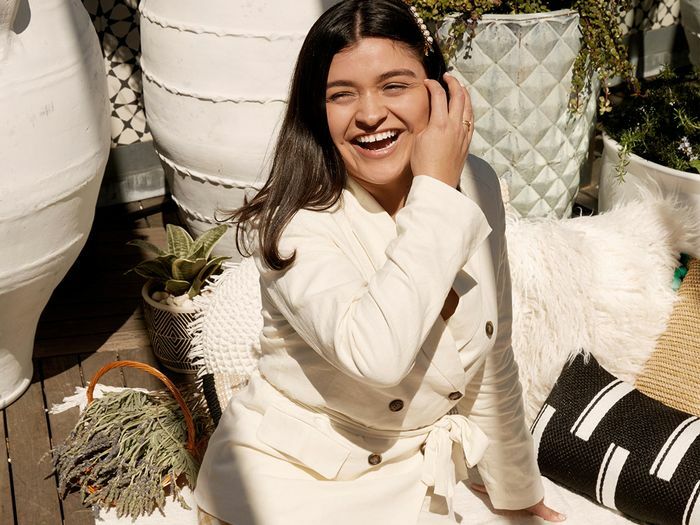 Here on the West Coast, fashion girls are taking an easygoing approach to spring's suiting trend. Think breezy silhouettes in lightweight linen and cotton that make the spring-to-summer transition a (literal) breeze. Let's face it: You'll always need a solid blazer and trousers to turn to, no matter the season, so opt for pieces like our popular Double Breasted Belted Blazer and Wide Leg Palazzo Pants that exude effortless polish. Last month, we predicted that everyone would soon own these flattering (under-$40!) shoess—aka our Danielle Vinyl Heeled Mules—and we were right. L.A. girls like Kaitlynn Carter Jenner and Becca Tilley jumped at the chance to style the black version the second warm weather hit. The boilersuit trend is approaching, well, a boiling point this spring, and our version happens to nail the look, if we do say so ourselves. There's no surprise why the short-sleeve style is an immediate hit with the L.A. crowd—the warm-weather piece is as versatile as they come and as these Angelenos prove, it's all in the styling. Gingham? For spring? Groundbreaking (spoken in Miranda Priestly's voice). Seriously, though, if an image of a red-and-white checkered picnic tablecloth is the first thing that sprung to mind, the neutral overhaul we gave to the print this season actually does feel novel. Try out the trend with a matching top and pants set like Raeann Langas or style the one-piece on its own with fresh white accessories like Emily Vartanian did. Speaking of spring outfits, see which spring dresses the fashion set will be all over.